'Good posture for great golf' should become your personal mantra, because good posture at address is the very foundation of a great golf swing. 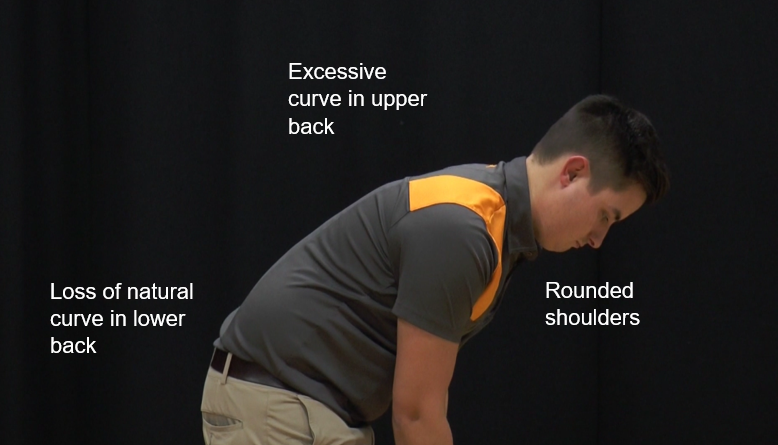 Many bring their everyday posture issues to their set-up: slumping in the upper back, rounding their shoulders as they move their hands in front of their chest to take their grip and dropping their chin down onto their chest to look down at the ball – all of which significantly restricts shoulder turn. They tend to become disconnected from their ‘core’ muscles and often initiate the downswing with their upper body instead of their legs and hips, causing the dreaded over-the-top move and out-to-in swing path so regularly seen in higher handicap golfers. Not infrequently the upper back becomes excessively rounded because the golfer has ‘flared’ his elbows. This is a damaging set-up flaw, because it can lead to ‘chicken winging’ and ‘flipping’ and makes a proper roll release biomechanically more difficult. It is important that the elbows essentially remain in neutral alignment, with the back of each elbow pointing at, or just outside, its respective hip joint, so that the palms naturally face each other. 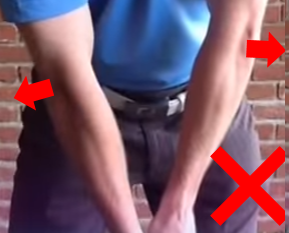 In their attempt to imitate Ben Hogan, golfers often overdo the ‘tight elbow’ posture and, as a consequence, assume an overly weak grip. They don’t realise that Hogan developed the technique in an attempt to eradicate his destructive hook, hence his weak lead hand grip with a short thumb straight down the top of the shaft. It’s perhaps worth pointing out that around 80% of tour pros use a grip that would be considered stronger than neutral. Good posture and a correct hip hinge at address is the foundation of a proper hip turn. Although it’s true that the hips must counterbalance the forward-leaning upper body, it is important that the hips hinge in the correct manner and a neutral lumbar curve is maintained. All too often, I assume as a result of being told they should "stick their bum out", I see golfers with varying degrees the so-called ‘S’-posture, in which the buttocks stick out too far, causing excessive curvature in the lower back. This restricts mobility because, besides tensing up the muscles, it places the pelvis in a tilted position in which it cannot rotate properly. If spine angle is to be maintained, the hips must stay back as they rotate, which places considerable demands upon the hamstrings and glutes to stabilize the pelvis. The sedentary nature of modern lifestyles means these muscles are notoriously weak in most people, so it is perhaps to be expected that a high percentage of golfers find it difficult to maintain their spine angle throughout the swing and are plagued by early extension issues. Without conditioning, these problems will persist. 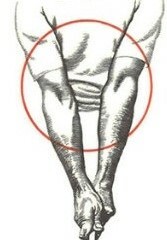 S-posture is often accompanied by over-flexing in the knees, (right) which again inhibits mobility. Correct knee flex provides stability without tension and helps align the pelvis with the spine, which is crucial for rotation. Also, good knee/hip alignment is vital, because it allows the head of the thigh bone to sit in the hip socket correctly and joint centration provides good structure around knee (important for both pelvic control and knee health). The hip joints are one of the major suppliers of rotation and, as mentioned a moment ago, joint centration is necessary for optimal functionality of the pelvis. If the knee is collapsed inward (knee valgus), the hip internally rotates and the pelvis moves into anterior tilt, changing the firing patterns of the muscles around the spine. The large back extensor muscles tend to become overactive and the deep abdominal muscles underactive, which completely changes spine mechanics and has hugely detrimental effects on its ability to rotate. In such circumstances, the body simply finds ways of compensating to make things work. 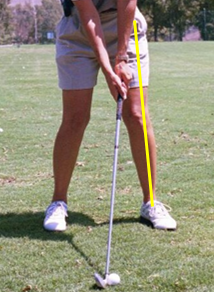 Typically, most players look to achieve around 45° of pelvic rotation in both directions (back and through). Fit golfers should expect about 45/50° of internal hip rotation and 15° of internal rotation of the shinbone (plus a small amount of foot supination). 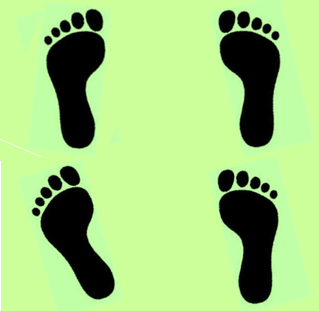 The remaining 25/30° of rotation occurs through ankle and foot placement. 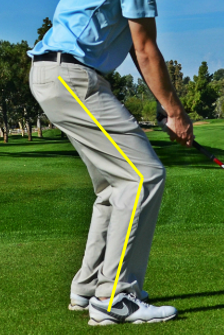 So, if the lead foot is placed square to the target line (top right), the body is deprived of around 15° of rotation and its ability to load around the lead leg through impact is inhibited. Personally, I like to place my trail foot square to the target line, because it helps me coil properly in the backswing, but I flare my lead foot out (bottom right), because it not only helps me to get through the shot properly, but also helps to reduce the torque going through the lead knee and ankle at peak velocity. NB: Our two Foundation Level videos [‘Achieving Good Posture’ and ‘Maintaining Good Posture’] provide all the information and conditioning exercises you may need to help you first to achieve a good set up posture and then to maintain your angles throughout your swing.